Love the cat Steve. Short hair all black cats are my fav. I had three in a row all and I named them all the same. How are you doing? Painful rehab? Glad to see you on the website. Bella hopes Steve is feline better. Rehab actually helps! After the ice and (yes a bit painful) stretching, the pain is hardly there. It's overnight and mornings that are more difficult. I'm taking narcotics to sleep through the night, but only Ibuprofen during the day. I'm back at work full time -- sitting at a desk all day is easy on the leg. The monster bandage comes off in two days, Friday (at 2 weeks). Physical Therapy and working it on my own has gone well. The doc told me I'm well ahead of the average. Walked half a mile this evening. Sleeping is still giving me trouble. Going to try a switch from Percocet to Vicodin tonight. No meds during the day. The doc told me I'm well ahead of the average. Walked half a mile this evening. Wow! If this keeps up, we’ll have to do two trips this summer, rather than only one. You must be doing great because of being in such great shape. More power to you. Please be careful regarding the vicidin.(SP?) Keep up the good work! Regarding Percocet vs Vicodin: Made no difference. Both give me about 4 hours that I can sleep. Took the V at 2AM, P at 5AM. I'll be back to 1 P tonight -- have to be back to work at 8 AM. BTW: I'm 3 weeks post-surgery now. Made a looong Marathon drive to southern Cal and back, 12 hours driving yesterday. The leg did just fine, except it got a bit annoying and somewhat painful during the always-present L.A. stop-and-go traffic jams. Moving the foot often from accelerator to brake and back was like PT. I really appreciated getting out of that and back to where I could use cruise-control. That sounds great Steve and good luck the rest of the way with your rehab. Progress report: a little over 10 weeks after the surgery. I've been riding my mountain bike about once a week -- can ride for 2 hours without any trouble. I can almost climb the steep slopes I did before, but not quite. There is still a little weakness in the quadriceps that is getting better. Trying to hit the gym 3X per week, doing leg presses and knee extensions each time. The operated knee is definitely a lot weaker than the other. I can press 200 with the good leg, only 140 with the right. Knee extensions are about half the strength of the good leg. But I am able to add more weight in each of these exercises almost every week. Going down stairs is still not steady. That leg press weakness really shows up going down. Heading upstairs is ok, but the leg is a little weak. I need to head out and try a short hike on a trail with serious inclines to see how well I can do. I still have swelling around the knee cap area. When leg is extended and relaxed, I can move the knee cap around and it looks and feels like it is floating around in a bunch of mush. Going in to see the doctor in a week to make sure all of this is normal. Wishing you the best Steve! I think you will treat it with the intensity it deserves! zapanther, thanks! I went through all the PT my insurance would cover -- 12 visits over 6 weeks. I have done all that, and am pushing everything as much as I can. I got in some hike/walks this past weekend, 3 miles with some terrain, 2 miles including some sandy beach. The leg is only mildly sore from all of that. I'll be hitting the gym again tomorrow. P.T. is what makes or breaks a full recovery. That’s what I would have thought. When my wife got her first TKR, she did a ton of P.T. and used a fancy machine that slowly flexed her knee for several hours a day. She recovered fine. When she got her second TKR, there was a communications and scheduling SNAFU. It was two weeks before she finally got to P.T. They did one session and sent her home with a few exercises to do on her own. Second recovery was better than the first. Go figure. 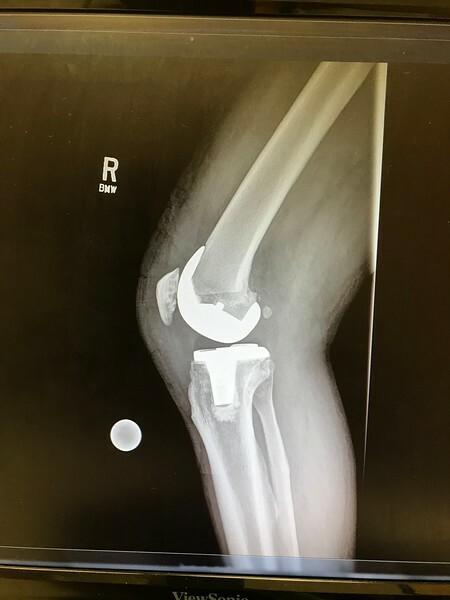 My wife had a total knee replacement about 2 years ago, and her surgeon said something interesting: He actually encouraged her to do low-impact weight-bearing activity (walking, hiking, etc...but no running). 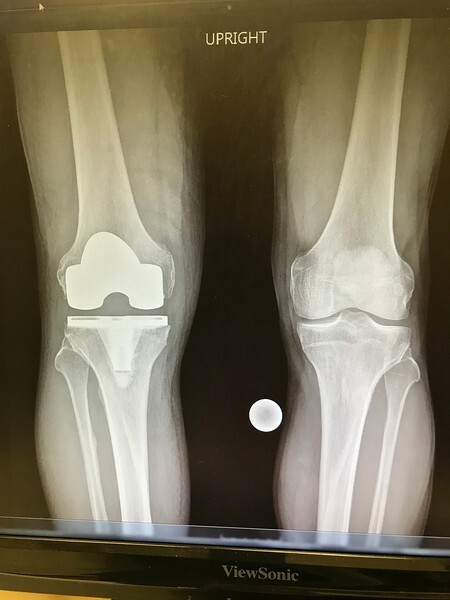 The reason is that the weight bearing maintains or increases the leg bone density, and serves to help lock the knee replacement implants in place more firmly. For me, the word was "you can do anything except no running". I asked about emergency run across the street examples, and that was ok. Just no jogging. I may try jogging "across the street" just to see how any emergency will work out. Workouts continue to show improvement. Stairmaster until my heart can't keep up. Rowing machine is as good as before. Spin cycle: alternately stand at 23, rest at 13 for 30 or 60 second intervals is really helping. Generated in 0.209 seconds in which 0.174 seconds were spent on a total of 14 queries. Zlib compression disabled.